WEST VALLEY CITY, Utah -- The shot couldn't possibly go in, but it did. Sweden couldn't possibly lose, but it did. And the kind of upset that couldn't possibly happen with NHL players now dominating the Olympics is a reality. The puck, driven by Vladimir Kopat of Belarus, bounces off the head of Sweden's goalie Tommy Salo for the winning goal. Vladimir Kopat scored on a 70-foot shot that bounced wildly off goalie Tommy Salo's head with only 2:24 remaining and Belarus scored one of the greatest upsets in Olympic history Wednesday, beating Sweden 4-3 in the hockey quarterfinals. Yes, Belarus believes in miracles, too. "For sure, it is a miracle for us," Belarus goalie Andrei Mezin said. "But sometimes a gun without bullets can shoot, and that was us. We've made our place in history." In a stunning game reminiscent of the United States' "Miracle on Ice" over the Soviet Union in 1980, Belarus won despite being outscored 16-2 in its previous two games and being a 10-million-to-1 shot to win the gold medal. The only comparable upsets in Olympic hockey history were the United States' 4-3 victory over the Soviets in 1980 and Great Britain's 2-1 win over Canada in 1936. "I don't understand how we could lose against this team," Swedish captain Mats Sundin said. As the game ended, the stunned Swedes -- easily the best team in the Olympics until now, with a 3-0 record and impressive wins over Canada and the Czech Republic -- stood silently as the Belarusian players swarmed Mezin, who stopped 44 shots. Mezin played for five U.S. minor league teams before giving up on any chance at the NHL and now plays for Berlin in the German elite league. "He played the game of his life," Sweden coach Hardy Nilsson said. "For some reason, we did not have the strength to beat them." Belarus, which survived a week of preliminary round play just to reach the field of eight and then was outscored 22-6 in its three pool-play games, had lost its two most recent games by 8-1 scores, to the United States and Finland. During practice Tuesday, Belarus coach Vladimir Krikunov reminded his players of the 1980 U.S. victory, although he didn't realistically think a team with only one NHL player could beat a team as good as Sweden. After the preliminaries, Krikunov said he only wanted a respectable showing as the still-developing former Soviet republic builds a sports program. How's this for respectable: Belarus will play the winner of Wednesday's Canada-Finland game in the semifinals Friday. "For sure, it is a great holiday for our country," Krikunov said. In Sweden, however, the TT news agency called the loss "Sweden's worst ever Olympic fiasco," comparing it to the Swedish national soccer team's loss to Japan in the 1936 Summer Olympics. "It's a devastating loss for us and our country," Swedish forward Markus Naslund said. Sweden, which didn't play with any desperation or fear until the third period, had tied it at 3 on Sundin's goal at 7:56 of the third. But Kopat's game-winning shot, which will be replayed countless times, came from the Olympic rings along the right wing boards near midice and ricocheted off Salo's headgear, bounced behind him and scooted into the net as he looked d frantically behind him for it. "It was just a shot from the red line and ... well, that's what happened," said Kopat, who seemed as incredulous about the goal as anyone. Even Ruslan Salei, Belarus' only NHL player said afterward, "It was a lucky goal." "The shot hit me somewhere around my neck, and I thought I could get a glove on it," Salo said. "I didn't feel it hit my back, but somehow it went in." Despite Nilsson's prophetic admonition that "it's a quarterfinal and you never know," the game started predictably with a Nicklas Lidstrom power-play goal at 3:10 of the first period. But Sweden, so fast and efficient before, got sloppy and careless after that, once almost allowing a goal while on a 5-on-3 advantage. "We should have put this team away in the first or second period," Sundin said. Oleg Romanov tied it with Belarus still down a man, scoring short-handed on a slap shot from the top of the right circle at 7:47 of the first. Dmitry Dudik scored during a two-man advantage later in the period to give Belarus a 2-1 lead. Right about then, Belarus began to play as if it thought it could win. To counter Sweden's dynamic "torpedo" system, Belarus counterattacked aggressively to take advantage of the Swedes' reliance on one defenseman as an extra forward. Michael Nylander tied it for Sweden later in the period, but Belarus regained the lead when Andrei Kovalev stole the puck at midice and beat Salo -- the hero of Sweden's 1994 goal medal shootout victory over Canada -- on a breakaway at 2:47 of the third period. It is the second quarterfinal upset loss for Sweden in as many Olympics. 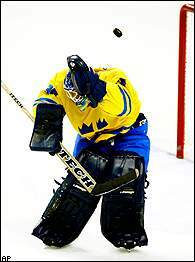 Finland beat the defending champion Swedes 2-1 in 1998.